In Rationalizing Capitalist Democracy, S. M. Amadae tells the remarkable story of how rational choice theory rose from obscurity to become the intellectual bulwark of capitalist democracy. Amadae roots Rationalizing Capitalist Democracy in the turbulent post-World War II era, showing how rational choice theory grew out of the RAND Corporation’s efforts to develop a "science" of military and policy decisionmaking. But while the first generation of rational choice theorists—William Riker, Kenneth Arrow, and James Buchanan—were committed to constructing a "scientific" approach to social science research, they were also deeply committed to defending American democracy from its Marxist critics. Amadae reveals not only how the ideological battles of the Cold War shaped their ideas but also how those ideas may today be undermining the very notion of individual liberty they were created to defend. "A most interesting examination of the evolution of rational choice theory within economics, political science, and philosophy, and she describes as well how its emergence fits into the intellectual politics of the cold war era. The depth of reading and analysis is most impressive . . . Rationalizing Capitalist Democracy is an excellent work of research and a useful, engaging presentation of ideas. It will repay reading by all economists, historians, and political scientists interested in the development of ideology." "This book should be widely consulted by anyone working in the field of social policy today. This is an engaging and important book ." "The difficult texts in the canon of rational choice theory are discussed with clarity and insight. 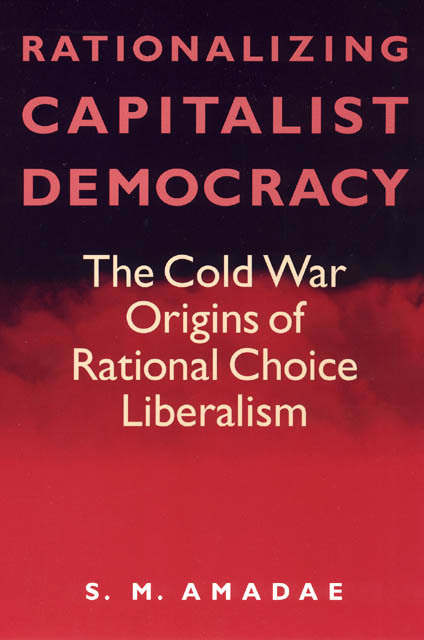 For those who want to know this intellectual history, this is the book to read. . . . That rational choice provided a foundation for some Cold War liberals is important and worth understanding. This book provides the means for such understanding."